Toy news update: Bootleg battles (FINALLY), Mattel is dying, Hasbro powering up, and Funko is OVER 9000! I’ve been busy with working a new job back in IT but this time a focus on building business!! As a veteran pioneer of the e-commerce landscape and a proven brick-and-mortar business battler with the bumps to prove it, I’m on the hunt to grow money this time with business partners!! More on that later. Now lets get down to the fun part Toy news!! 1) MGA’s head honcho Issac Larian has been busy working on busting the bootleggers of the popular LOL Surprise dolls. According to an article release by toyworldmag.co.uk, MGA hired investigators, lawyers, and even personal action against a retail shop producing counterfeit products. Although this is a new, aggressive move by a major toy producer here in the US, the hobby industry has been fighting counterfeits FOREVER. I can remember bootleg Gashapon and Banpresto figures as far back as 2001 when I started my own business. Bootlegs are never as good as the original, but as time goes on and if no action is taken, they do become ‘acceptable’ but the general audience. This is always dangerous on multiple angles including consumer safety brand integrity, and a legitimate business bottom line including authorized distributors, retailers, licensees, licensors, and producers. Its especially dangerous when the target market happens to be kids 12 years of age and younger. I had to deal with bootlegs and because my niche was small enough, it wasn’t too hard for real collectors to be aware. Some companies took matters into there own hands by creating ‘authorized retailer’ lists on their websites and creating videos showcasing authentic vs bootleg. As a matter of fact, here’s one from my old site that I contracted out many years ago (thank you, Ryan!). Ultimately, in order to stop this at least from China, the biggest proponent of counterfeit everything, is to tax them to high heaven. As bad as it sounds, the tariffs that are being applied should also include toys not just for the the protection of the businesses, but also for the safety of the consumer. This should go all the way down to any package, not just cargo ships, very similar to the way Brazil’s customs controls their packages. The proposed tariffs might already have this in the list, I’m not sure. Let’s hope so. Mattel recently announced a significant layoff movement due to its forth straight quarter of losses. Not a good sign for the once powerhouse of toys and iconic figure of the Toys That Made Us documentary. I feel this will make the company very susceptible to an actual purchase before long, and Disney may very well be a dead ringer for this. After all, the princess dolls from Mattel were always known to be MUCH better than what Hasbro produced, and Disney from what I understand doesn’t really have a fleshed out toy division. It helps that Mattel is located in the the same town as Disney. If this happens, you can probably assume that Hasbro will probably lose A LOT of what’s making them hot right now. Speaking of Hasbro, they are currently killing it with its collection of licenses and especially its games, that have propelled it’s stock to grow instantly over 10%. With Hasbro’s claim that D&D is at an all time high, and with its positive sales of Marvel and Star Wars toys, even in a year where toys felt a fatal blow with the vanishing of TRU, Hasbro is confident that it’ll stabilize by 2019, which is an amazingly strong sign. Articles talk about Hasbro and Mattel possibly merging, which would be good for Hasbro so they could have a Los Angeles office, but as the new CEO of Mattel has a history of selling out to Disney, I still stand by my initial prediction. I definitely look to see more come from Hasbro. Maybe they can cause a collector’s craze as intense as Funko has just recently. What was that about Funko? Oh, that the offer to sell the Funimation SDCC exclusive on Funimation’s site crashed the server. For a site that hosts high def streaming shows of fan favorites like Dragon Ball Super, you can only imagine the amount of traffic needed to bring an entire platform to its knees. That’s exactly what happened according to an article on Polygon. 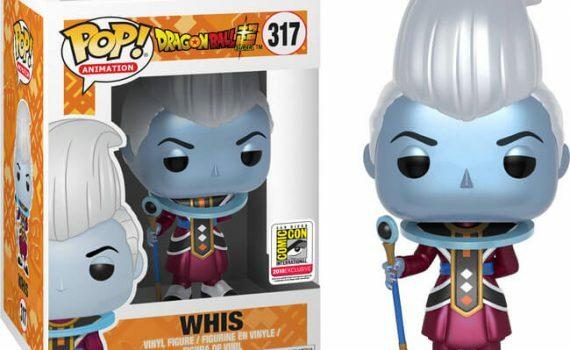 Apparently, the day it went up for sale for a mere $24.99, the system broke within hours forcing Funimation to pull the item from its store and apologizing to all those looking to snag the coveted metallic version of the character Whis from Dragon Ball Super. Its hard for me to believe that this figure is so much in demand as I have sold this particular character in other forms for over 2 years. I admit, Funko is doing it right! Its currently selling for about $200 on eBay and other retailer sites. I’m sure you’ve seen all the coverage you need for Anime Expo and SDCC, so I won’t go there. That’s all I got for now. Thank you, and I’m glad to be of service.